So, you've chosen the magnificent Big Island for your vacation in paradise - we think you've made an excellent choice. There is no better way to see the sights than with a bird's-eye view. We know you're eager to start planning your adventures. To this end, Hawaii Guide has hand-picked what we think are simply the best Big Island aerial activities to enjoy. Take the family parasailing, hang glide with your mate, or go full adrenaline rush on a sky dive. Whatever adventure you choose, you'll love our great rates. Now pick your adventure and get ready to fly. The Big Island is a great place to enjoy a helicopter tour, as there are so many places that are best appreciated from the air: cascading waterfalls, towering sea cliffs, and, of course, the famous Big Island volcanoes and lava flows that constantly reshape the landscape. Best of all? With a helicopter tour you’ll always enjoy the best seat in the house. Don’t miss out on the excitement; book your tour today! Looking to tour the Big Island’s black sand beaches, volcanoes, lush rainforests, and deep valleys from above? Want lots of leg room and your own window seat? How about the opportunity to watch the sun set behind Mauna Loa in a spectacular array of colors as you fly by and through the beauty all around you? Sound good? Then check out these unforgettable airplane tours and book today. So you’re up for an aerial adventure but just can’t shake the need for an adrenaline rush, too? Then maybe a parasailing adventure is just what you need; it’s easy, fun, and exciting for nearly everyone. Or try your hand at a powered hang glider and soar over manta rays, dolphins, and more as you fly overhead. 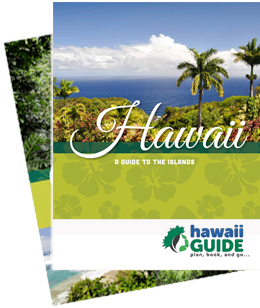 At Hawaii Guide, we have a high-flying adventure for everyone… book yours today!